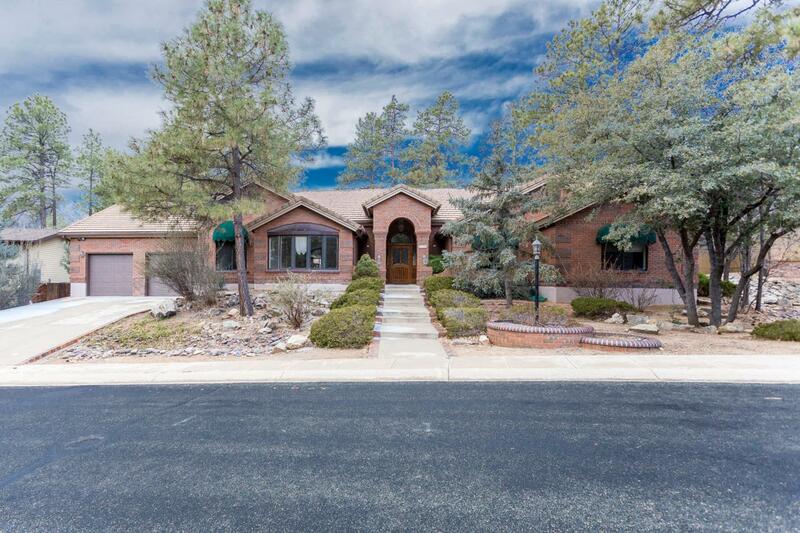 Stunning and rare, SINGLE LEVEL custom home offers gorgeous brick exterior set in the tall pines of highly desirable Timber Ridge featuring outstanding curb appeal with raised brick planters, boulders & concrete tile roof! Upon entry into the foyer, you're greeted by coffered ceiling and backlit elegant cabinetry/display cases that is adjacent to formal living room with vaulted ceilings & extensive and beautiful woodwork. Gourmet updated kitchen offers beautiful cabinetry with pull out drawers, gorgeous granite countertops, spacious island with prep sink, electric Jenn-Air cooktop, wall oven, stainless steel appliance package and massive walk-in pantry!CONTINUEBreakfast bar off kitchen opens to great room which has a floor to ceiling brick fireplace with custom mantle, fireplace with blower which is gas or wood-burning compatible, as well as built-in bookcases on either side. There is an informal dining area off of the kitchen/great room as well as formal dining room with functional bay window in the front of the home with built in storage cabinets. Also adjacent to kitchen is a walk-in "flex" room which would be perfect for small office, or craft room! Large master suite offers vaulted ceiling, private & dedicated access to rear patio, dual & separated vanities, massive walk in closet, garden tub with separate shower. Guest bedrooms are large in size and have brand new carpeting, both offer ceiling fans, and good closet storage. Guest & powder baths are comfortably sized and have executive (raised) height toilets. Extensive woodworking and decorative glass-front cabinetry and attention to detail is evident in many locations of the home, as well as wood window sills. Other features include a den/office or potential 4th bedroom, extensive tile and wood laminate flooring throughout all wet/traffic areas of the home, endless storage cabinetry and spaces including attic above the spacious laundry room which has tons of cabinetry, utility sink and built-in ironing board. Rear yard is low maintenance natural / native landscape which can be enjoyed from the extended covered patio as well as upper patio. Additional interior features include central vacuum, surround sound in many locations including rear patio, extensive data wiring, security system, skylights for added natural light, dual zone HVAC systems, as well as two hot water heaters. Wood laminate flooring and carpet was installed in winter of 2018! Oversized two car garage with room for small workshop or added storage and there are security screen doors on nearly all exterior locations.